This series is basically a manga review series. I spend a lot of time in reading various manga (literally meaning right to left, comics which should be read from right to left. opposite is manhwa); I enjoy many of them and don’t enjoy some of them. While clearly this depends on one’s taste but then one also should have his/her distinct opinion. I will be reviewing and grading (on a scale of 100) a manga every chapter. Also I am not a generous critic. So anything above 80 you can consider a must read/legendary manga. While above 60 is a good manga and below 30 is manga you shouldn’t even bother. 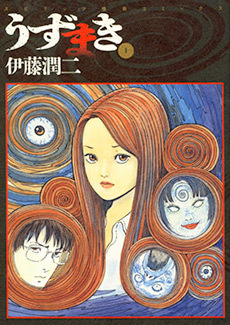 I will be starting with a relatively-less-famous-outside-japan, Uzumaki by Junji Ito. Uzumaki literally means spiral in japanese. Junji Ito is considered to be a horror master in Japan. Uzumaki is pretty unconventional manga in a sense there is no specific ghost/spirit haunting someone/someplace. Instead it is the spiral shape which haunts a small town named Kurôzu-cho. It is story of a small town named Kurôzu-cho. It is a peaceful happy town but then suddenly strange events start occurring. What we read ahead is account of those events through eyes of a girl Kirie. It starts with Mr. Saito, father of her boyfriend Shuichi and soon the entire town is taken over by the curse. To be frank, the plot seems ok on the first glimpse apart from the idea it is not a black-haired woman (a japanese cliche) who is haunting; which certainly is refreshing. Kirie Goshima and her boyfriend Shuichi Saito are protagonists of the story and it unfolds through a variety of attacks of the spiral shape. It is here exactly where Mr. Ito scores highly. He creates diverse situations out of nowhere and all of them are scary. Mr. Saito’s obsession is illustrated brilliantly and we kinda get drawn into the story just for the sake to find out what exactly is causing all these spirals? Some of the scenes are absolutely chilling – Shuichi’s mother herself pierces her ear to get rid of the spiral part inside, and the chapters ‘Jack in the box’ and ‘Umbilical Cord’ leave no stones unturned to scare you. It is not a manga with weak hearts!! The basic plot is as described above. Rest are the stories/strange occurrences with Kirie’s friends which you should read on your own. In the end author tries to give a scientific angle to story. I am not sure whether this is good or not but certainly this move left less questions unanswered. In my opinion Ito gives full justice while drawing the events. Some the drawings are excessive gory while sometimes you might feel it is gross but then the storyline demands it. Again it is not a manga for children so one can expect the artist to go a little overboard. As it essentially is horror story, fear is the emotions we expect and the art adds to genuine scares. Firstly this manga is exclusively for someone who like horror stories and is ok with a little gore. While there are some romantic scenes as well some comic scenes but it is the scares that catch you and that is how it should be. I would say it is one of the best horror manga ever written; perhaps the best apart from Drifting Classroom by Kazuo Umezu. It is definitely worth a look for a different story and brilliant illustrations. Rating : 82/100 – Uzumaki just makes it into legendary mangas according to me.